UPDATED: Wed., July 4, 2018, 5:34 p.m. 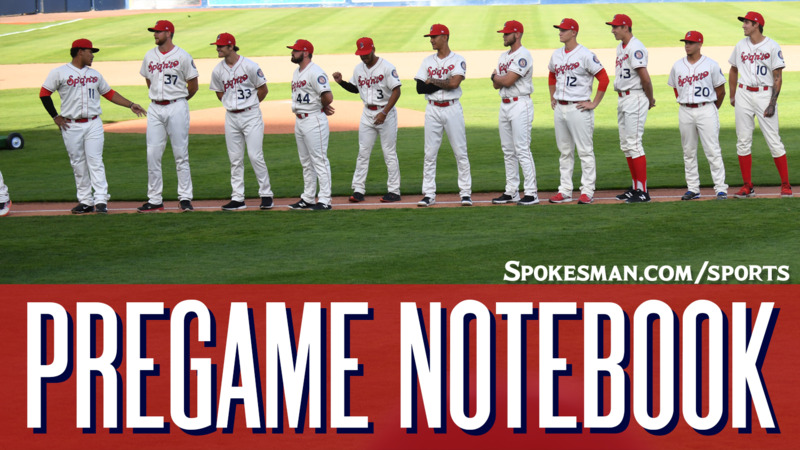 The Spokane Indians (6-13) take on the Tri-City Dust Devils (9-10) in the first of a three-game Northwest League series at Avista Stadium at 6:30 p.m. The Indians send LHP Jake Latz (0-1, 5.40) against RHP Adrian Martinez (0-0, 6.23). Latz was roughed up last time on on June 28 against Everett, allowing six earned runs on seven hits and two walks with a home run and three strikeouts over 5.1 innings. Martinez started the season with Low-A Fort Wayne and pitched to a 9.87 ERA in eight games including one start. Only once at that level this season dud he give up fewer earned runs than innings pitched. Last time out against Vancouver on June 28 he gave up one run on four hits and one walk with four strikeouts over five innings. Spokane has won 7 of 8 on 4th of July and 10 of their last 12 on Independence Day. Player to watch: 1B/DH Curtis Terry leads the NWL in home runs (8), RBIs (21) and slugging percentage (7.67). Terry is hitting .342 at home. Tri-City top prospects: C Blake Hunt (2nd round/2017), INF Owen Miller (3rd/2018), OF Grant Little (2nd/2018), OF Mason House (3rd/2017), RHP Sam Keating (4th/2017), RHP Dylan Coleman (4th/2018). Last night: Tre Holmes homered and the Hops (13-6) topped the visiting Indians (6-13). Transactions: RHP Kyle Keith (22nd round/2017) and RHP Bobby Eveld (50th round/2010) were added to the roster, while RHP Blake Bass was promoted to High-A Down East. Promotion: The Indians celebrate our nation’s Independence with special edition hats that will be auctioned off to benefit the Fairchild Morale Fund. Stick around for a spectacular 4th of July Fireworks show immediately following the game. Weather: Game time – Partly sunny, 80. Final out – Cloudy, 72. Published: July 4, 2018, 4:13 p.m. Updated: July 4, 2018, 5:34 p.m.